President of the Senate, Dr Bukola Saraki has reacted to looters’ list recently made public by the Federal Government. 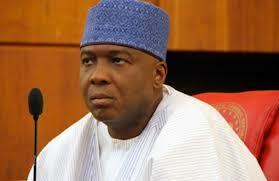 The lawmaker expressed concern over the tagging of some senators as looters. The list was released by the Minister of Information and Culture, Lai Mohammed a week ago. He said it was wrong for an arm of government to paint members of the other arm in bad light. He said, “In a situation where a particular arm of government stands up and calls people from another arm of government thieves, looters and other names, how can we work together?